We all know about lighthouses. Stories and pictures have been stored in our memories from childhood. 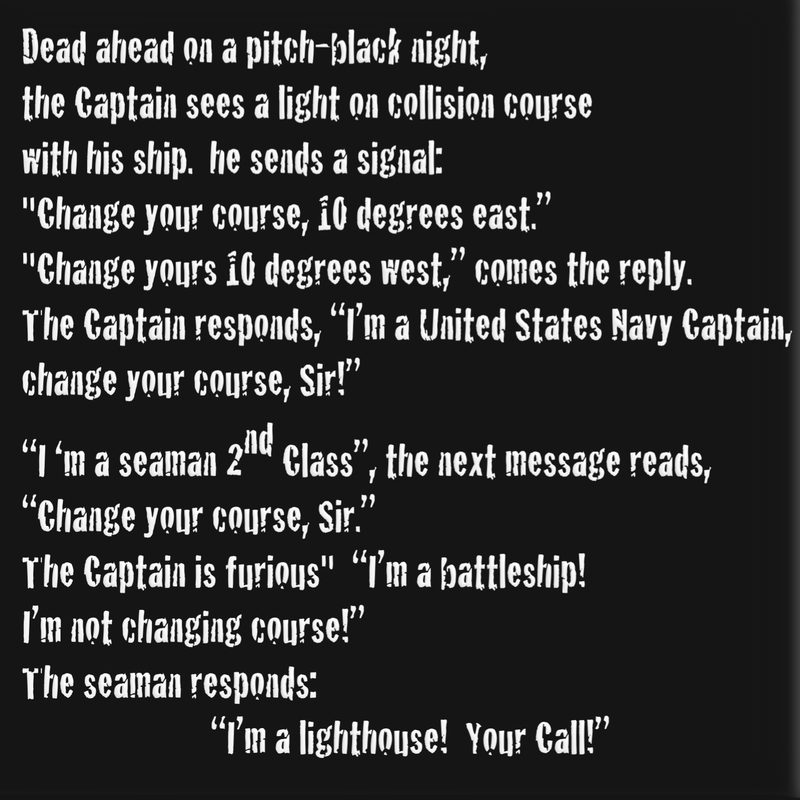 And now there are better ways today to warn ships of peril ahead than lighthouses, but I learned a good lesson about them from an old black-and-white movie the other night. Lighthouse keepers seem to have an easy job. Turn the light on at dusk and off at full daylight. So, light the lamp, go to bed, and turn out the light when you get up. Of course, it doesn’t happen that way. The windows of the lighthouse lamp must be cleaned each day, inside and out. A frosty or foggy window will not give a strong light to passing boats and ships. Every day all six or eight very large windows must be scrubbed and cleaned. Light bulbs are changed periodically lest one go out during a dark night. Weather reports must be monitored, so that passing vessels can be warned about high waves or low tides. Finding time to sleep must be difficult for the lighthouse keeper. It also can happen that the light in the lighthouse is mistaken for another vessel by a passing ship. Reader’s digest has printed this incident, which as we saw, is true. What does this have to do with us. If we are to project Jesus to those we meet, we must be like the lighthouse. Just as the lighthouse needs to be tended day and night by the keeper, so we must be tended by the Spirit. We can do nothing alone, but when we attend to the “Spirit Keeper,” we can do all things. Daily we must see that the windows of our soul and clean and free of smog, or frost. Just turning the light on is not enough. If we speak of Jesus, we turn on the light, but unless we show by what we do and how we live, the windows of our lighthouse are too soiled to give the light a way out. We need to clean our minds and hearts to admit that even when we do not see things that are detrimental to our spiritual growth, there are things there. The lighthouse keeper does not say, “The windows look clean enough to me. No need to wash them today.” No, there are always things we are not aware of that hold us back from becoming the strong beam Jesus wants us to be. One of the biggest deterrents to clean windows of the soul is pride. I used to think the Pride was being a stuffed shirt or prima donna. You know that person, “I am the best! You are less than me! Poor you!” Guess what! My thinking that they were the epitome of pride was my own pride! Pride is usually much more subtle. It can show itself by our thoughts of contempt, or annoyance, or ridicule of another. How often are we the outraged, but very wrong Captain? And how often are we the saucy lighthouse keeper who knew he was right? Gracious God, deepen my belief in your Word to me today. Help me to realize that I have been given gifts that Christ can use to bring about your Kingdom here on Earth. Direct my actions according to your good pleasure, that in the name of your beloved Son I may do good works. 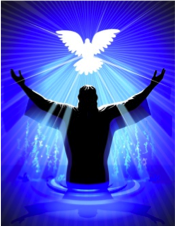 Keep me aware that “I am the holy ground” graced at Baptism for Jesus to be present with his loving, his caring and his peaces for our Global Family. I pray in Jesus’ name. Amen. Last week was National Vocation Awareness Week. A week of prayer for all of us to know and have the will to follow our God-given vocation we received through Baptism. The readings this Sunday continue that theme. In the first reading we get the idea that God will not give up on us. We will not be “forsaken”. And in the reading from St. Paul’s letter to the Corinthians we learn that each of us has different gifts to use. God does not want us to be all the same. It would be very boring. Our task is to use the gifts that God has given us for God’s honor and glory.How do you know you are using your gifts the way God wants you to use them? You can be sure if you are happy; if you feel you are making a difference in our world. To each individual the manifestation of the Spirit is given for some benefit. Then we come to the Gospel. Mary was using her gifts for the common good. She saw a need and did what she knew would make a difference. She went to Jesus. Sometimes we have to act in the same way: see a situation or a person who has a need; do what you can to help or relieve the person or situation, and then go to God in prayer. God will not leave us “forsaken”. Good and loving God, thank you for the talents and gifts you have given me. Please help me use them for the common good and for your honor and glory. Help me see the needs of people around me as your mother Mary did and have the courage to do what I can to make this world better. Amen. You have heard it said that one person’s trash is another person’s treasure. Perhaps that is why antique dealers do so well! But what if the things you consider trash are really trash. There was a time when trash was not packaged like presents but put loosely in a container. The trash collectors had a difficult time and a, unpleasant and sometimes hazardous task when emptying garbage food, and paint materials. Each family had its own way of putting things out. Some had boxes; some paper bags, and often wet or slimy material spilled out on the sidewalk. It was not unusual for a family to put their more stinky things in someone else’s trash can. Paint is a good example. If your family had a metal can, and we were using a cardboard box, it was mighty tempting to put our paint in your trash container. Not many did it without asking, but even so, the cleanup was tough. Strangely enough today we encourage and pay others to put trash in our spiritual baskets. We do not monitor our own TV viewing. We use language which would have brought a bar of soap mouthward when we were children. 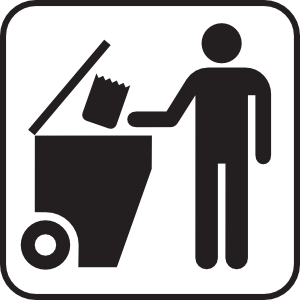 We are allowing and inviting others to put trash in our baskets without calling to mind what we said to youngsters. “What you put in your head will stay there forever, and will influence your decisions. Be sure the things you see, and say, and do are good. Not just OK, but good! Since you and I are children of God, we can certainly follow the good advice we gave children. We will never grow up in the eyes of God. We will always be his cherished children. Sweet and loving things ought always outweigh crime and gore. Crime does not require strength. Resisting crime does. Gentleness is harder to attain than gunfighting. Check what you are viewing. Does it make you a better person, or do you have to fight the thoughts that come because you are trying to resist what ought not have been part of your thoughts anyway. It is only a few weeks until Ash Wednesday and Lent. Now is not too soon to look at the trash we have been confessing. Why not try to eliminate it. As children of God we are born with the spirit of unconditional love and a wisdom that empowers us to bring about happiness. 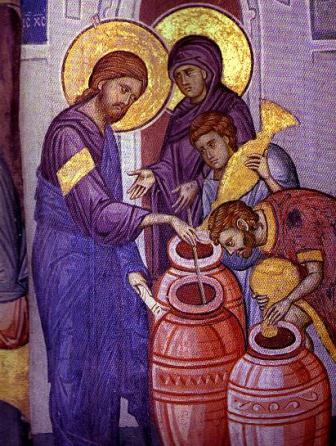 The Baptismal ritual anoints us to become servants of the Lord. This Lord does not wield power over us, but empowers us to serve. 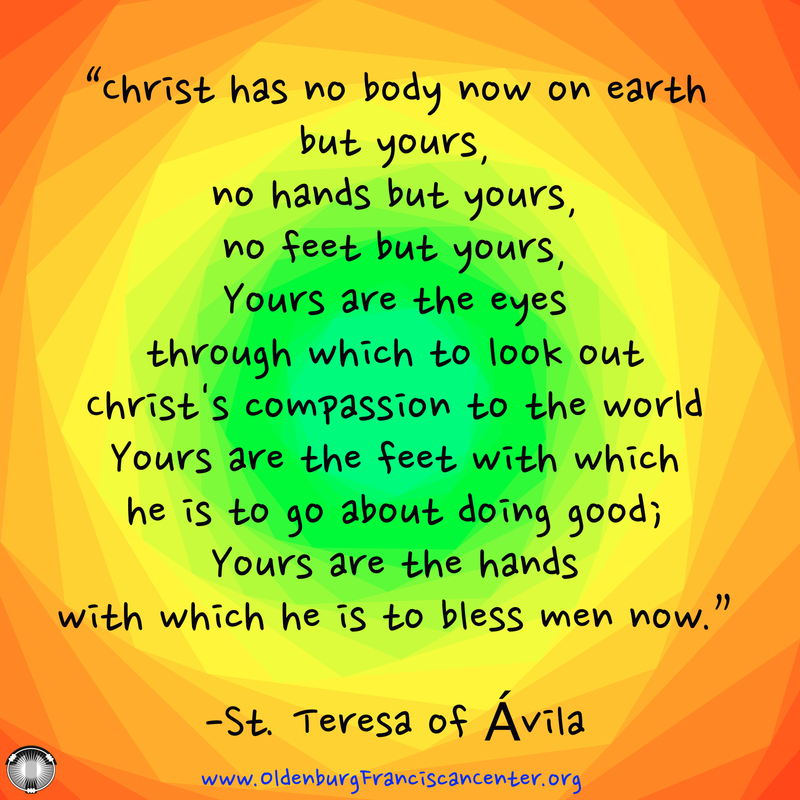 This is a vocation that implies service to all of God’s creation. We are called to live justly thus creating and maintaining a peaceful existence. The way to peace isn’t brought about by changing others to meet our idea of right living, but by quietly offering reconciliation and supporting the gifts of each other. 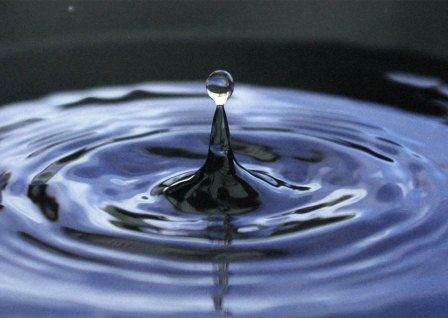 O most gracious and loving God, you wash us clean time and time again with the blessed waters of your forgiveness. May each new beginning provide a renewed birth to the gift of your Spirit allowing us to co-create a universe of peace and hope. A dear friend of mine, a bishop, once gave me the best picture of what happens to us at Baptism. I would like to explain it to you. As is usually the case, trying to get the message across when you received it from an expert, isn’t easy. Try to picture the Holy Trinity like the three arrows here. Each arrow represents the life and love of the individual persons, but if you remove any one of the arrows the trinity disappears. So the life of all three persons give to and receive from the others. Now what happens at our Baptism is this. We are caught up in the life of the Second Person of the Trinity, Jesus. But we cannot just be in the life of Jesus, because He is part of the life of the Trinity! So we, too, become part of the divine life of the blessed Trinity. What does this mean for us. At our Baptism, the life of the triune God became our life too. It is up to us to keep this life alive and thriving. How do we do this? Well, our brother Jesus, gives us the best example, as usual. He came to John the Baptist, completely free of sin, and ASKED to be baptized like the sinners coming to John. How many times do we put ourselves outside the sinners placed before us? Exploring the old phrase, “There but for the grace of God, go I,” we may find the answer. Therese the Little Flower had it right. When told she would have a very high place in Heaven, she said she would be as happy as she could be there. But if she had a thimble to fill with happiness, and you had a bucket, both of which were filled to the brim, who had more happiness? Each was as full os happiness as was possible given the size of their vessel. All the gifts we have had go to expand the size of our thimble. But if we keep only the amount that was there when we started, we are poor servants of the good God. We might have a ten gallon container with only a thimbleful of good works. To work at reaching the place God has for us, we must labor every minute, every second of our lives. The day we sit back and say, “OK, I have done everything I can,” we poke a hole in our bucket, or thimble. The big thing to remember is that this labor does not have to be heavy on our souls. Jesus is there, and picks up where our weakness slips. But we must be willing to admit the weakness and accept the help He gives. That is why Jesus was baptized. That is why the Father calls him, “My Beloved Son, in whom I am well pleased.” That is what the Father will say of us if we follow Jesus lead, and listen to the Spirit, the whole Trinity, whose life we share. OFC & Healthcharism partner to help improve community health! Five years ago, Anna Corwin, a PhD candidate from UCLA, visited several religious communities like the Franciscan convent in Oldenburg and was permitted to live with Sisters in one of them for 6 months. Her goal as an Anthropologist was to study the impacts of language, prayer, and world-view on health and aging processes. Anna Corwin chose American Catholic Nuns as the subject of her thesis because they have been estimated through other research to navigate the aging and illness process “more successfully” than the average American. Her question: why? Realizing the “holy” in everyday life is an important aspect of Franciscan spirituality. God is not just for chapels and bedtime prayers. God is in the shoveling of snow, the offering of a cup of coffee, the bandaging of a cut finger, the enduring of a business meeting that feels like a frightful failure. The Sisters’ have developed a skill for finding the sacred in each moment and accepting the gift of the divine through all of life’s events. As an individual who deeply understands the health benefits of spirituality, Brookville Resident Jennifer Profitt founded Healthcharism in 2012, and proposed a collaborative partnership with the Sisters’ Oldenburg Franciscan Center (OFC), which will move forward in 2013. First things first, Profitt and Wittekind feel that teaching Mindfulness and offering programs for reflective learning are primary for helping others achieve their health and wellness goals. Through Oldenburg Franciscan Center, Profitt and OFC Manager Angela Roesler will begin offering Spiritual Autobiography classes in January 2013, and Wittekind will continue offering workshops themed around Jungian psychology and mindfulness, as well as counseling & spiritual direction. Healthcharism workshops will be co-designed by Profitt and OFC staff to meet the needs of individuals & groups seeking healthier lives in a spiritual, yet ecumenical, setting. If you would like more information about this topic, call or write to Angela Roesler at 513-543-5368 or aroesler@oldenburgosf.com. Learn more about OFC Programming at www.oldenburgfranciscancenter.org. Look for more news to be coming soon!